Full of fun and fast accessories to knit to keep for yourself or give as gift. These patterns let the colors, fiber content and textures of the yarns shine. They’ll work well with solid, semi solid, heather, and even hand painted yarns. They should also work well with handspun yarn. 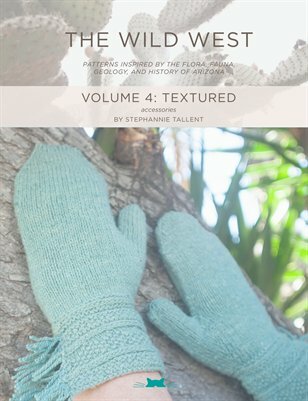 Patterns include Coyote mitts (both full & fingerless), with a textured gauntlet cuff with optional fringe; Gila fingerless mitts, a fun, corrugated-like unisex design; Mica cowl, with simple stitch patterns that interact with each other; Javelina hat, with a lovely textured section; and Painted Desert hat, with chevrons that create undulations in the other stitch patterns.